Food shortages in the arid Turkana region of north-western Kenya, where an increasing number of people are already unable to find enough to eat, could escalate if rains fail in March, an official warned. "With the prevailing drought, blanket feeding of the population may soon be the way to go," Geoffrey Kaituko, Turkana district drought management officer, said. The region has been hit by drought, insecurity, poor or no harvests, high malnutrition rates, water scarcity and high food prices. Children and the elderly, in particular, needed relief food to survive in all three districts - Turkana East, Turkana Central and Turkana South. Peter Smerdon, spokesman for the UN World Food Programme (WFP), said the Kenyan government, UN agencies and NGOs were conducting assessments following the October-December short rains to determine the numbers in need in Turkana and other districts. "We expect preliminary results from areas hit by the failure of the short rains, which include Turkana, to be released later this month and the final report in March," he told IRIN on 17 February. "WFP will adjust the numbers of people it feeds in Kenya accordingly." David Lotiang, the councillor of Kerio Ward in Turkana Central district, said he had heard of people dying of hunger-related problems, but could not confirm these reports because of poor roads and the remoteness of some villages. "Restocking of people's livestock and road repair are some of the urgent measures needed to curb this trend," he said. Kaituko said the quality and quantity of vegetation cover across the region had dropped. "Where there is still pasture, this may last only one month; if the March April rains also fail, the region will be in a full-scale emergency," he told IRIN. "People, as well as their livestock, walk long distances to get water, and this is another indicator of worsening food security since water bowls and shallow wells are drying up fast." There was also a problem of poor livestock health. "With pasture reducing, the animals are likely to starve, coupled with diseases such as PPR, which has killed millions of animals since it was reported in the country in 2006." Turkana is a net importer of food from other parts of Kenya, principally the North and South Rift. When the post-election violence in early 2008 hit these areas, the amount of grains, vegetables and fruits reaching Turkana dropped drastically. "Prices skyrocketed and this was compounded by the fact that the district started hosting [people] displaced by the violence and this put a strain on food security," Kaituko said. At the same time, livestock prices have continued to drop, with cows, sheep and goats fetching very little on the market; while the effect of the failure of both the short and long rains in 2007 and 2008 resulted in poor harvests and severe food shortages. Insecurity was another factor affecting food security in the region. Due to drought, people have moved to insecure dry-season grazing areas, mostly grasslands south of Lodwar. Cross-border conflict with Uganda subsequently increased, leading to loss of life and property and forcing many people to move to centres along the Kitale-Lodwar road where they could get relief. Cynthia Lokidor, the district nutritionist, said the prevailing global acute malnutrition (GAM) rates of 21.5 percent and severe acute malnutrition (SAM) rates of 3.5 percent were alarming. NGOs such as World Vision and Merlin were supplying nutritional supplements to the most vulnerable. Nutrition surveys by Merlin in April 2007 in the region showed levels of malnutrition in children under five at 22.5 percent, way above emergency thresholds. 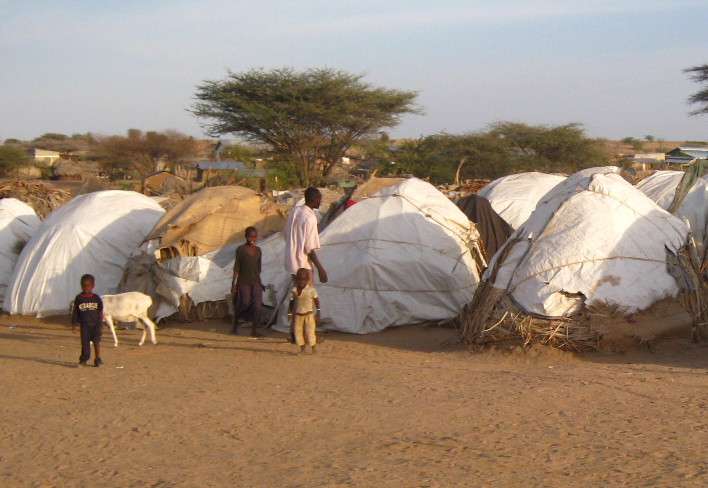 The Kenyan state ministry for the development of northern Kenya and other arid lands said the situation was deteriorating in all Turkana's four livelihood zones - pastoralist, agro-pastoralist, fisher-folk and fisheries, as well as urban and peri-urban. Smerdon said WFP was keen to encourage community involvement in building assets such as water pans, in return for food assistance. This would help build community resistance so they could support themselves through drought and poor rains.